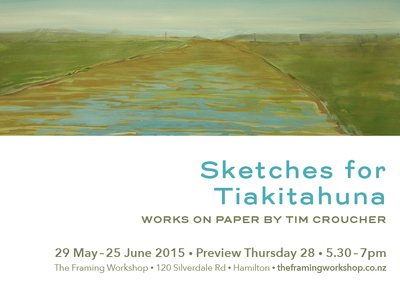 Croucher, Tim (2015) Sketches for Tiakitahuna; works on paper by Tim Croucher. Sketches for Tiakitahuna, Framing Workshop, Hamilton, NZ, 29 May - 25 June 2015. This small solo exhibition presented developmental works toward the project Pioneer Highway in which autobiographical, historical and fantastic scenes are depicted.